The other afternoon there was a stunning sunset taking place. I reached for my camera and did my best to capture the God moment before it disappeared. I became frustrated trying to snap pictures of the beauty in between all the houses around me. I felt uncertain that I captured anything I would be pleased with or would do justice to the real thing. I wished I had noticed the sunset happening earlier so I could have driven to a better location with an unimpeded view. I was so doubtful, I simply put my camera away and didn’t even care to look at the pictures at that moment. Subsequently, I forgot I had even taken them. This morning, I woke up feeling mopey and defeated about some of the ventures I want to accomplish in my life and feeling like I’m not ever getting anything really worthwhile done. The daily stuff of life seems to always be sucking all my time, and/or I don’t manage my time as well as I should. And I wondered if I was even meant to successfully accomplish the things that are on my heart to do. The little steps I take here and there don’t seem to amount to much. After my defeatist feelings morning, I sat down and uploaded the images of the sunset to my computer, and I was stunned. They turned out beautifully! In spite of the obstacles of houses and buildings that had been in my way, I had managed to take these amazing photos of the sky and some of them even included the mountain range. Wow! I had doubted that my efforts had produced anything worthwhile, and it was proven to me otherwise. I realized there was a lesson for me to take to heart. In spite of the obstacles constantly before us, we accomplish great things with small steps even when success is not immediately evident to us. 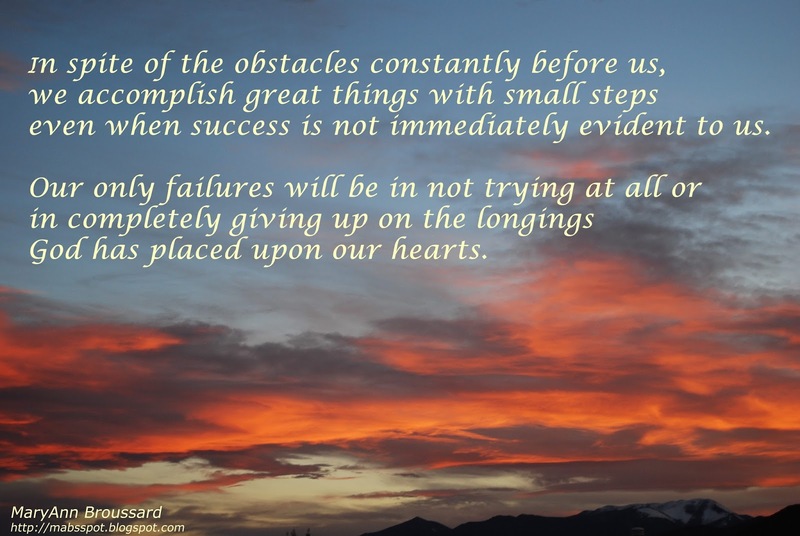 Our only failures will be in not trying at all or in completely giving up on the longings God has placed upon our hearts. May I remember this again and again.